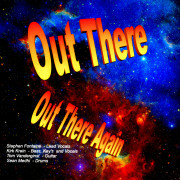 The band Out There released their new Out There Again album in June of 2015. This album features former Uriah Heep and Joshua vocalist Stephen Fontaine, Kirk Krein on Bass, Keyboards and Vocals, Tom Vanderginst on Guitar and Sean Medhi on drums. The album has a classic rock style with a mix of old and new material as well as three covers – Stealin by Uriah Heep, Space Truckin by Deep Purple and Love Welcome Home by Giant.